If you’re a fan of the Harry Potter movies, you’ll recognise a number of filming locations in Oxford. 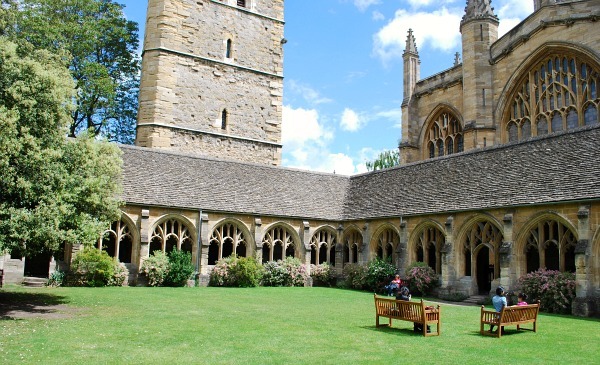 There are guided tours you can take like the Oxford Harry Potter Film Locations Tour but if you don’t fancy that, here’s our guide to the main ones to see…. 1. The Hogwart’s Infirmary. Throughout the Harry Potter movies there have been a number of occasions where the Hogwart’s Infirmary was featured. These were all filmed at the Divinity School at the Bodleian Library in Oxford. Imagine some hospital beds and screens in the picture above and you’ll get a good idea of how it looked. Admission to the Divinity School is included in most of the tours of the Bodleian Library you can take, including the mini tour for £6 (2018 prices) which includes the library below. 2. 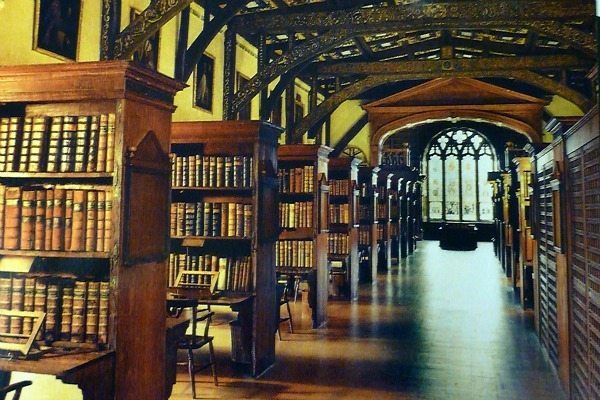 Hogwart’s Library – Duke Humfrey’s medieval library at the Bodleian Library in Oxford doubles as Hogwart’s library in the Harry Potter films. Former users of this beautiful library include 5 kings, 40 Nobel Prize winners, 25 Prime Ministers of Britain and famous writers like Oscar Wilde, CS Lewis and Tolkien. You can only visit the library as part of an organised tour and be warned, they book up fast! 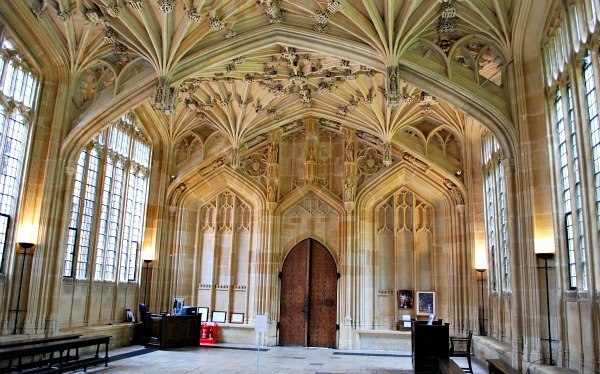 Both the standard and the extended Bodleian tour will call in at Duke Humfrey’s Library. Standard tours are £6 for adults and extended tours are £9 (2018 prices) and you can book tours in person at the Library. 3. The Hogwart’s Cloisters. In Harry Potter & the Goblet of Fire, many of the other students have turned against Harry – some are even wearing ‘Harry Stinks’ badges. The cloisters at New College, Oxford were used for a memorable segment of the film where Moody turns Malfoy into a ferret. The inside of the cloisters are seen in the movie along with several scenes outside around the giant oak tree. New College is open to the public daily from 11am to 5pm in the summer with adult admission of £5. The entrance is on New College Lane, so follow the road under the bridge of Sighs. In the winter admission is free between 2pm and 4pm though the entrance on Holywell Street (2018 prices). 4. Hogwart’s Hall. 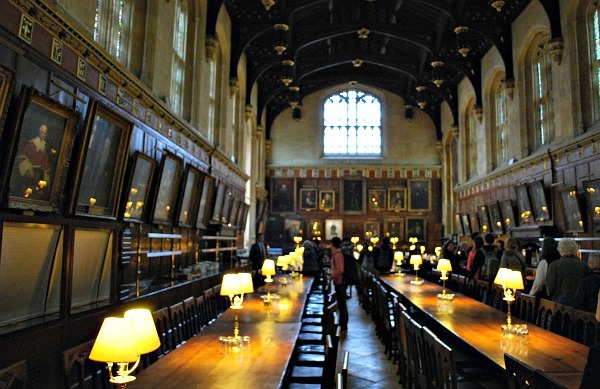 Christ Church college dining hall is the inspiration for Hogwart’s hall in Harry Potter. The movie producers came to see it, but instead of actually filming in the hall, they made a replica in a studio. You can definitely see the similarities though if you visit Christ Church. The college is generally open from 10am to 4.30pm daily, but there are times when access to the hall is not included. For instance, it is often closed from 11.40am to 2.30pm for dining. Make sure you ask at the ticket kiosk to be sure that it’s open before you enter. 5. 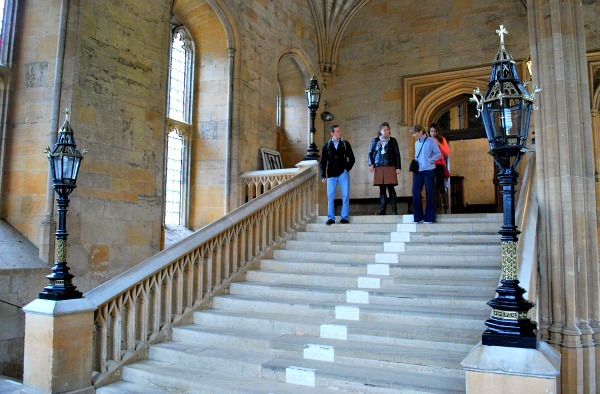 Welcome To Hogwart’s – The steps up to the dining hall at Christ Church College were used in the first Harry Potter movie. It’s here that Professor McGonagall says “Welcome to Hogwart’s” when the new student’s arrive. The steps are busy when the hall is open to visitors, so taking photos can be difficult. Christ Church college is open as above.